The following blog post discusses findings presented in an award-winning article by Dr. Shaheen N. Awan, Ph.D., CCC-SLP, winner of the 2016 “Journal of Voice Best Paper Award” in the Speech-Language Pathology/Vocal Pedagogy category, awarded at the Annual Symposium in June 2017. This article examines the CSID as a potential screening tool for voice disorders. The utility of clinical cutoff scores for the CSID is also discussed. In contrast to other medical specialties, the field of voice disorders lacks a “gold standard” method for diagnosing disorders of interest. On the contrary, a variety of imperfect reference standards are employed to differentiate between “non-voice-disordered” and “voice-disordered” patients, or “controls” versus “cases,” respectively. Recently, spectral- and cepstral-based acoustic methods, particularly when combined into the CSID multivariate formula, have shown promise as potential dysphonia screening tools for their low cost, efficiency, and robust results. In this vein, Awan et al. conducted a case-control study to evaluate the diagnostic accuracy of the CSID as compared to other methods, such as patients’ self-perception of their voice handicaps or physician-conducted laryngeal evaluations. The study included 332 subjects, all of whom had presented to a physician with a voice complaint. Three reference standards were used to differentiate cases from controls: auditory-perceptual judgment (dysphonia +/-), Voice Handicap Score (VHI +/-), and laryngoscopic/stroboscopic diagnosis (laryngoscopic +/-). 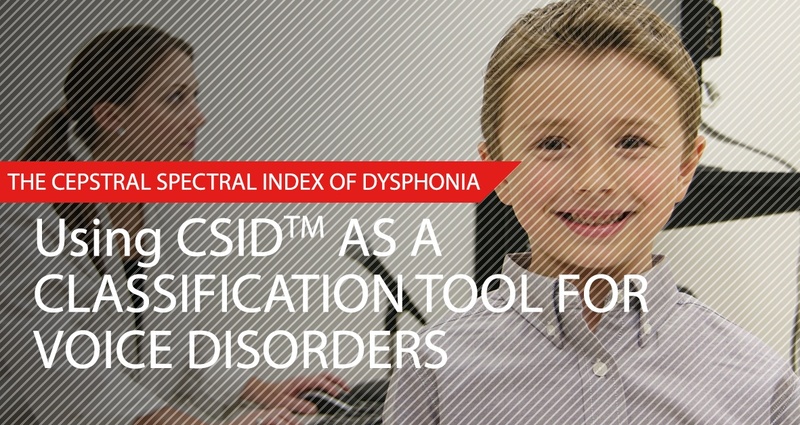 The CSID was used to determine dysphonia severity during subjects’ readings of The Rainbow Passage (CSID). A combination of logistic regression and ROC analyses was used to compare the classification of the CSID with the three reference standards. The CSID demonstrated a strong ability (AUC 0.85) to differentiate between dysphonia-positive and dysphonia-negative subjects as determined by auditory-perceptual judgment. A cutoff CSID score of ≈24 was associated with good to very good test accuracy, resulting in a balance between sensitivity and specificity (79.4% vs. 79.0%, respectively) and impressive positive and negative likelihood ratios (3.78 vs. 0.26, respectively). A more liberal cutoff of ≈19 may be preferable for screening purposes, however, given its superior sensitivity (87%) and adequate degree of specificity (60%). Compared to its use with the auditory-perceptual judgment reference standard, the CSID performed less well diagnostically when case versus non-case categorization was determined by VHI (AUC 0.75) or laryngoscopic evaluation (AUC 0.73). However, these lower AUCs were still considered adequate. Notably, subject age was observed to be a significant covariate in the classification of dysphonia-positive and VHI-positive cases versus controls (AUCs ≈ 0.02-0.03). In accordance with prior research findings, this study demonstrated a strong correlation between cepstral- and spectral-based indices (included in the CSID algorithm) and listener appraisals of dysphonia severity. Also consistent with previous literature, the CSID did not perform as well when either VHI or laryngoscopic evaluation was used as the reference standard; this is as expected, given that CSID was originally designed to be used with auditory-perceptual judgment as the reference standard. The CSID provides a high degree of accuracy in the classification of voice disorders, particularly when auditory-perceptual judgment is used as the reference standard. Ideal cutoff scores will vary within the range of ≈19-24 based on clinician preference; liberal scores should be considered for screening, while conservative cutoffs are preferable to defray high costs of further evaluation. Awan, SN; Roy, N; Zhang, D; Cohen, SM. “Validation of the Cepstral Spectral Index of Dysphonia (CSID) as a Screening Tool for Voice Disorders: Development of Clinical Cutoff Scores.” Journal of Voice 2015; 30(2): 130-144. Accessed June 2, 2017.